With a full-bodied, rich and refreshing taste and a bright, inviting color, English Breakfast is the perfect tea for anytime of the day. 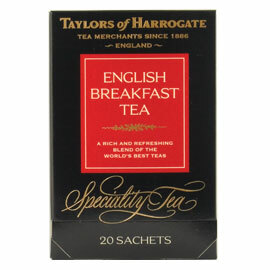 This much-loved classic English Breakfast is a very special blend of teas from two of the world's most famous tea growing countries, India and Africa. The taste is full-bodied, rich and refreshing, with a bright, inviting color, making it the ideal tea for enjoying not just at breakfast time, but also at any time of the day. 20 wrapped bags/sachets per box.